For those of you that know Jessica well, you will probably remember your own sense of surprise when I posted pictures of her eating oranges. Yes, Jessica, the great hater of all things orange (except candy corn) is now a lover of oranges. Just this past weekend, before traveling back to Delhi on the bus, she is the one who suggested that we get a kilo or so of oranges for the ride home. Well, for those of you that fully appreciate that little blurb, I bring a new and shocking revelation. Jessica, under her own will and power, decided to give blood. Yes, she faced down the huge needle and gave a full unit of blood. Of course she scared the crap out of all of the doctors and nurses on duty because of her contorted face and streaming tears, but she ever-so-confidently assured the medical staff that she was "not suffering" and it didn't hurt "too much". In her words, she just "hates needles". OK, and for everyone else who doesn't know Jessica well enough to laugh at that, you can enjoy the back of the Muesli label that we recently finished. Just keep reading, it gets better and better. Yes, Cory, we did see the Arabic script, and we were able to read it, though we don't know the meaning of the sounds we were making. 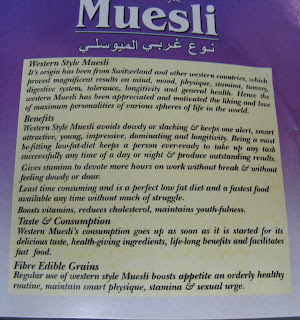 Do you think this Muesli will work for seniors as well???? yes, it DOES keep getting better and better and better! Where can I get me sooooome!! sorry, i guess i need to scroll down more often... it means "quality western Muesli" but it's in the wrong order... you guys know "grbi" from your time living in the "mgrb". oh i'm so proud of you both, least of all for your arabic abilities.